:: Bag People Blog :: Your Promotional Bag Specialists ::: Is this the best value Promotional Bag available? Bag People - Your Promotional Bag Specialists - are always on top of new developments. Here's a great way to get your message out there without breaking the budget. Heat Sealed Non-woven Fabric is the way. They carry loads of gear. They stay looking good for ages. They can be reused 100's if not 1,000's of times. These bags will keep everyone happy - all the departments of your company + your customers. 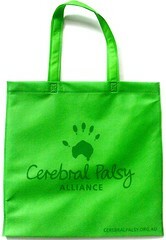 Contact Us to get these bags for $0.50 for Australia & New Zealand or £0.30 in the UK.